Participation in research is a key component of undergraduate education in biology. Some local opportunities for such participation are highlighted in the links below. Most Biology faculty members welcome undergraduate participation in their research. We've posted some tips on how to secure a spot in a faculty lab. Here is a site for you to find and apply for available positions in labs at the beginning of each semester. Any Biology major can apply! Supports undergraduate research in a laboratory or field setting outside of the United States. This Five College program offers several paid summer internships related to marine biology. 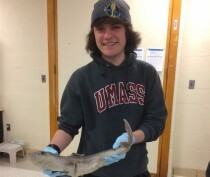 The program's web site also provides links to many other marine science internship opportunities.